A recently leaked, unpublished paper from NASA reveals that NASA has made a functioning Radio Frequency Resonant Cavity Thruster, otherwise known as electromagnetic propulsion drive or EM Drive or Warp Drive – a space engine with fuel-free propulsion system. The EM Drive uses magnetic waves to create thrust by bouncing microwave photons within a closed cone-shaped metal vessel shown below. The motion causes the pointed end of the drive to generate thrust and propel it in the opposite direction. The microwaves gather electricity via solar power and it does not require a propellant. Critics remain skeptical about the idea saying that the engine violates basic Newton’s Third Law of Motion, which states that for every action there is an equal and opposite reaction. According to state-of-the art theory, a warp drive could cut the travel time between stars from tens of thousands of years to weeks or months, of transporting humans to Mars in 10 weeks, fly to the Moon in four hours, and travel to Pluto in only 18 months – all without the need for a propellant. As detailed in the paper, NASA physicists led by Harold “Sonny” White and Paul March were able to generate thrust in a “tapered RF test article” (EmDrive prototype) during a series of tests at NASA’s Eagleworks Labs at Johnson Space Center in the fall of 2015. In short, the NASA engineers are trying to determine whether faster-than-light travel — warp drive — might someday be possible. The team is attempting to slightly warp the trajectory of a photon, changing the distance it travels in a certain area, and then observing the change with a device called an interferometer. As detailed in the leaked paper, the NASA EmDrive test consists of a closed copper cone, that is bombarded with microwaves. The researchers powered it with 40, 60, and 80 watts and found that it generated up to 58, 128, and 119 micronewtons of thrust, respectively. Given that this “anomaly” was still observed by White and his colleagues after accounting for error, this suggests that the results of the experiment show an EmDrive is possible. Based on the released paper, the researchers estimated that their contraption would be capable of generating approximately 1.2 millinewtons of thrust per kilowatt in a vacuum were they to scale up the power input. 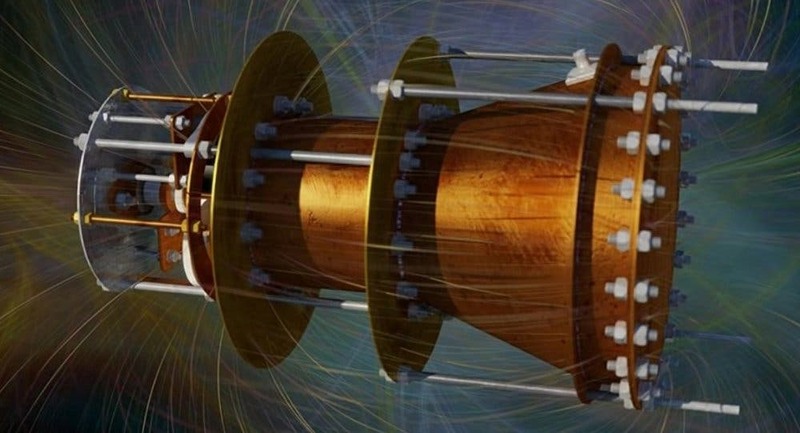 To put this in perspective, the Hall thruster—one of the most powerful in development and powered by ejecting plasma—generates about 60 millinewtons of thrust per kilowatt. While the level of thrust to power is significantly smaller than ion thrusters, the researchers said it is twice as powerful as the thrust of light sails – currently the most popular form of zero-propellant propulsion, which uses beams of sunlight to propel it forward. As Newton showed in the 18th Century, if you want to propel a rocket through space, you’re going to have to eject some material in the opposite direction of the rocket’s travel. But an EmDrive appears to generate a reaction without any action. A number of theories have been floated attempting to explain this ostensible violation of the bedrock of physics. White has been a proponent of the quantum vacuum explanation, which posits that the EmDrive is able to generate thrust by acting on virtual particle pairs that are generated by fluctuations in the quantum vacuum (in this theory, these vacuum fluctuations are created by the electromagnetic field generated by the EmDrive). In essence, the microwaves would be ‘pushing off’ of these virtual particles within the EmDrive cavity to generate the thrust that has been observed by White and his colleagues in EmDrive experiments. Another leading explanation is that the EmDrive’s thrust is generated by radiation pressure, a position held by its inventor Roger Shawyer. On this view, when the microwave radiation enters the copper cavity, the radiation pushes against the walls of the EmDrive and generates thrust. Yet, according to Woodward, both of these theories are unlikely to be correct for the simple reason that physics doesn’t allow them. But since the EM Drive involves electromagnetic microwave cavities, it does not have a reaction mass. In 1994, a Mexican physicist, Miguel Alcubierre, theorized that faster-than-light speeds were possible in a way that did not contradict Einstein by harnessing the expansion and contraction of space itself. Under Dr. Alcubierre’s hypothesis, a ship still couldn’t exceed light speed in a local region of space. But a theoretical propulsion system he sketched out manipulated space-time by generating a so-called “warp bubble” that would expand space on one side of a spacecraft and contract it on another. White believes that advances he and others have made render warp speed less implausible. Among other things, he has redesigned the theoretical warp-traveling spacecraft — and in particular a ring around it that is key to its propulsion system — in a way that he believes will greatly reduce the energy requirements. But ”We’re not bolting this to a spacecraft,” he said of the technology. White likened his experiments to the early stages of the WW11 Manhattan Project, which were aimed at creating a very small nuclear reaction merely as proof that it could be done. NASA –“Is It On the Verge of Discovering ‘Warp Bubbles’ Enabling Dreams of Interstellar Travel?